Have mass media and consumerism hijacked India’s holiest event? India’s Kumbh Mela (literally, “Pitcher Festival”) is mind-boggling in scale. The largest gathering of humans in one time and place, the event is held every three years, roving between four locations across India. While all four of the events are “mega” in scope, the Maha Kumbh Mela, held on the twelfth year in Allahabad at the confluence of the Ganges, Yamuna and mythical Saraswati rivers, is the granddaddy of them all. So great is the size of the gathering that the crowds can purportedly be seen from space. The Maha Kumbh happened to fall in 2013, starting from January 14, and goes until Sunday. On February 10 alone (the main bathing day) an estimated 30 million people, from ash-covered holy men to earnest pilgrims, filed into the Ganges River to take a dip in its frigid waters in the hope that the act would wash away their sins. Photos of this immense bathing ritual can be seen here, while some of the diverse characters populating the event can be seen here. The dedication earnest pilgrims need to reach the sacred spot is not to be taken lightly. 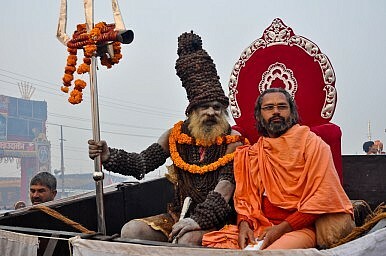 In an academic essay titled Seeing, Being Seen, and Not Being Seen: Pilgrimage, Tourism, and Layers of Looking at the Kumbh Mela, Dr. Kama Maclean, associate professor of South Asian and world history at the University of New South Wales, cites a litany of problems and dangers that may befall visitors to the Kumbh Mela, as originally proposed by British sociologist John Urry. These include: malaria, Giardia, tuberculosis, food poisoning, water contamination, being trampled by Naked Sadhus (as happened at this year’s Kumbh Mela on February 10, leading to 36 deaths at Allahabad railway station), hepatitis, typhoid, rabies, Japanese encephalitis and plague. “While hazardous travel is styled among some travel subcultures as valiant (think: backpackers’ circuit or the hippies’ trail), this remains an impressive and not entirely exaggerated list of perils to face,” Maclean writes in the paper. Faced with these risks, armchair travel is an appealing alternative to the real thing. Responding to this need to visit events like the Kumbh Mela virtually, photographs, text and video (like National Geographic’s Inside the Mahakumbh) documenting the scale, drama, color and occasional tragedy of the event have flooded online media outlets during the past two months. If anything, the spectacle of up to 100 million pilgrims gathering near the bank of the Ganges has attracted perhaps too much attention from both domestic and global media organizations. As a result, the Kumbh Mela has become saturated by and transformed by media coverage to a degree we may not yet comprehend. One result of this media hype can be seen clearly on display at this year’s Maha Kumbh Mela: The festival has become intensely commercial. This push, which Arora calls an “appeal to the masses” – domestic in this case – has not been limited to India. Western travelers toting copies of Lonely Planet dutifully make their way to the Kumbh thanks to the hype that now surrounds the event in the Western imagination. In Seeing, Being Seen and Not Being Seen, Maclean notes that the event is on the list of 100 Things to Do Before You Die, a consumer’s guide to adventure travel. Alas, not even a boat ride with real pilgrims guarantees an authentic experience at the Kumbh Mela today. According to an article in Pitch – which offers reduced figures of 80 million for this year’s Maha Kumbh Mela, resonating with Maclean’s assertion that accurate data is hard to come by – marketing ran amuck at this year’s Kumbh. “A sea of brands have taken a holy dip at the festival; each vying for the crowd’s attention through innovative branding and advertising,” the article reads. From branded roti (unleavened bread) designed to promote the HUL (Hindustan Unilever) brand of soap to more than 15 Coca-Cola vendors dotted across the festival’s grounds, consumerism was fully entrenched along the mighty Ganges this year. While it’s easy to be hypocritical in judging these things – after all, the Western world is responsible for inventing the bulk of consumer culture that has overrun traditional events like the Kumbh Mela – it’s a sobering indication of the true extent of consumerism’s reach.